This was the place I wanted my students to get to before we dove deeper into global warming. During the rest of the unit, I hoped their concern for Kiribati would stay with them as they learned that pseudo-scientists were paid to present false information about climate change. They would learn that corporations have tried to point the finger at individual consumers when, in fact, corporate practices are the lion’s share of the problem. They would learn that oil companies spend far less than 1 percent of their budgets on renewable energy development, while making billions in profit and painting themselves green. They would learn that a modern form of colonialism, climate colonialism, continues to exploit our atmosphere and impoverish and destroy countries like Kiribati. They would learn that, despite the warnings and urgent calls for help, nations have not passed binding treaties. In the end, through role plays, simulations, and community action with organizations such as Bill McKibben’s 350.org, I hoped students would see themselves as truth-tellers and change-makers. But it all starts with caring. The places where we live have a profound effect on our lives. They influence our ideas, beliefs, and how we see the world. Places give us meaning. Our memories make us who we are and are inseparable from the places where they are made. So what happens when our place gets destroyed? What happens to the people who are uprooted, ripped from their homes, torn from their place? We need to stop thinking of global warming as an abstraction. It is Kiribati. It is Katrina. It is Superstorm Sandy. Here in Oregon, it is a future of coastal towns inundated at high tide; increased wildfires, insect outbreaks, and tree diseases; and increased risk of heat stress on crops. Global warming is you and me and all of us. Kiribati is just the beginning. Green(ing) English: Voices Howling in the Wilderness? Copyright © 2013 Rethinking Schools. Reprinted with permission. Bennon, Brady. 2013. 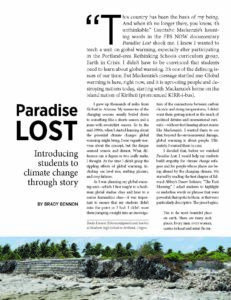 “Paradise Lost: Introducing students to climate change through story.” Rethinking Schools 27 (3): 54-60.